Simply put, hampers make the perfect gift as they cater for all types of recipients and their different tastes. Hampers make great gifts for families, friends and business associates. Imagine the delight as your recipient opens the hamper and uncovers each delicious item one by one. Larger hampers also make great family gifts with many products to ensure suitable treats for all family members to share. Finally, hampers can be enjoyed over a prolonged period, such as the holiday season and well into the New Year. Did you know gifts.ie are one of Ireland's largest hamper companies? We're also the best in the business! Since 2000, we've been assembling all hampers in our warehouse in Dublin bringing you the best direct prices in Ireland. PRODUCE: We insist on only the highest quality products and taste test everything to ensure our high standard is maintained. Unlike our competitors, most of our food products are now sourced from Irish indigenous suppliers. Using strict QC procedures, all expiry dates are carefully monitored and dispatched well in advance of these dates to ensure the recipient can enjoy the goods at their leisure. Our hamper contents are modified each year, should you wish to give a similarly priced hamper to the same recipient. LUXURY GIFT BOXES AND HAMPER BASKETS: We use our signature high quality rigid luxury gift boxes for most of our hampers. This contains a satin bow and is manufactured exclusively to our custom specifications. They are not only attractive, but also provide a very practical means of storage, be it in the kitchen, living room, bathroom, bedroom or playroom. SHIPPING: We use reliable nationwide carriers, each parcel is fully insured and can be tracked and traced. If there are any delays, we can contact the couriers directly for fast resolution. 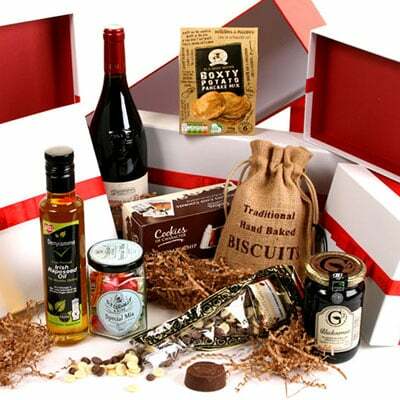 GREETINGS: All hampers can include your own corporate literature / complimentary slips. Alternatively, we can include individual personal greetings in each hamper on our standard gift cards free of charge. ALL YEAR ROUND SERVICE: Although Christmas is our busiest period, gifts.ie provides a professional hamper and gift service all year round. We're here to assist you with all your corporate and personal gift requirements whenever you need us. Six amazging wines; a great gift for every wine lover. The six bottles wine are presented in an wooden gift box with lid. Reusable, the box is packed inside a separate shipping box for secure transport. Note: In the unlikely event of a hamper item not being available from our local suppliers, the item will be substituted for a similar or upgraded product to ensure speed of shipment.